Andromeda was the daughter of King Cepheus and Queen Cassiopeia, who were the rulers of an ancient land called Aethiopia. Cassiopeia was very conceited and claimed she was more beautiful than the Nereids, the daughters of Poseidon. Poseidon, who was the God of the Sea, was not impressed with Cassiopeia's boastful nature and sent Cetus, a sea monster, to ravage the coastline of Aethiopia. Cepheus consulted the Oracle of Ammon and was told that in order to rid their coastline of the monster, they had to offer their daughter as a sacrifice. Reluctantly, they chained Andromeda to the rocks along the coast, leaving her there for Cetus. Meanwhile, Perseus - the Hero - was returning home after having defeated the Gorgon Medusa. Medusa was so hideous that anyone who looked at her was turned to stone. Perseus came across the helpless Andromeda, bound to a rock. He was riding on the back of Pegasus, the winged-horse, and so he swooped down, pulled Medusa's head from his bag and showed it to Cetus. The sea monster was instantly turned to stone and sank to the bottom of the ocean. 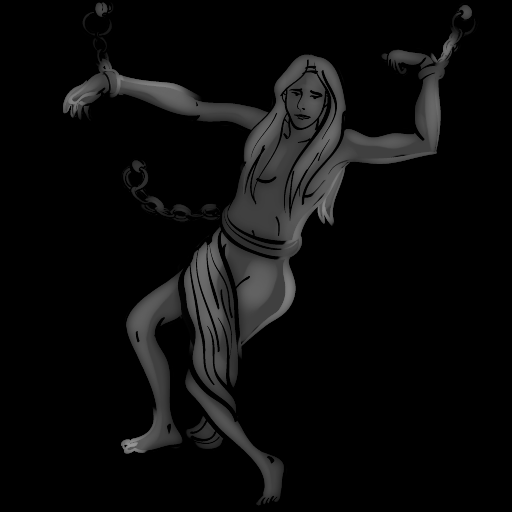 Perseus then cut the chains and set Andromeda free. Soon afterwards, Perseus and Andromeda were married. Hercules was the great-grandson of Perseus and Andromeda. The Greek goddess Athena was said to have placed Andromeda in the night sky.